Any list of great Russian centers would start with Anatoly Tarasov who centered the Soviet Union's first national team and then became the coaching guru who led them to international success. Such a list would also include Russian Hall of Famers Arkady Chernyshev, Victor Shuvalov, Alexander Almetov, Vyacheslav Starshinov, Anatoly Firsov, Vladimir Petrov, Slava Bykov, Igor Larionov, Alexei Zhamnov, Pavel Datsyuk and Sergei Fedorov. Fedorov is a likely future Hockey Hall of Fame member who has scored 472 goals and added 674 assists in 1,196 NHL regular-season games and 50 goals and 114 assists in 165 Stanley Cup Playoff games. 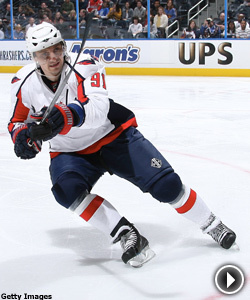 He is plus-257 in his 19 NHL seasons and plus-37 in the playoffs. He was the first Russian player to reach 1,000 points in the NHL and is fourth all-time among Red Wings in goals, assists and points. So what the heck was he doing playing defense for the Capitals against the Philadelphia Flyers in Game 3 of their Eastern Conference Quarterfinal game Tuesday night? He's been averaging more than 18 minutes per game, but played 21:07 Tuesday. "Either we got injured or I don't know," Fedorov offered after the game. "I wasn't quite sure at first why, but we were down to five defensemen. I think a couple of guys were struggling with injuries. Coach and I came to a decision. I volunteered to play a little bit of defense and he agreed. I went back there for a couple of shifts. It worked out good so I stayed for a couple more." Jeff Schultz suffered an upper-body injury in his fifth shift and the loss of the Capitals' best defensive defenseman exposed a glaring weakness. The Flyers exploited the Capitals' defense repeatedly and when Mike Green objected to the embarrassing treatment, Scottie Upshall one-punched him to the ice in a brief scrum that took the Capitals' best offensive defensemen off the ice for seven minutes early in the third period while the team was trailing by two goals. Milan Jurcina and Shaone Morrisonn were intercepted on outlet passes that the Flyers converted to goals. Green hauled down Mike Richards and was called for a penalty shot that Richards converted. Tom Poti was called for three penalties. John Erskine was given less ice time than usual. The NHL's youngest defense looked it, after looking like a cohesive unit during the regular-season stretch run. Washington coach Bruce Boudreau had shuffled his forward lines before Game 3, inserting Eric Fehr, benching Tomas Fleischmann and moving center Brooks Laich to right wing. Boudreau opted to move his second-line center, Fedorov back to the point and moved Laich back into his usual center position. Boudreau thought Fedorov did a good job. "I thought he moved the puck well," Boudreau said. "The pace of the game was such that our 'D' was getting pretty tired, especially when Mike Green broke a skate blade in the second period and missed time and then he got seven minutes in the box. We needed to give these guys a break and if we ever need to put Sergei back there, what better time to experiment at it? So, that’s what we did." This wasn't Fedorov's first experience at defense in the NHL. Former Red Wings coach Scotty Bowman used him there at times when they were together in Detroit, partly out of need and partly to motivate him to play harder when he got back on a forward line. Columbus Blue Jackets coach Ken Hitchcock also used Fedorov as a defenseman in limited situations during his stint in Columbus. If Schultz can't return for Game 4, expect to see Steve Eminger in the lineup and Fedorov back centering right winger Alexander Semin and perhaps Laich.